1 of 4 Preheat oven to 325 degrees F. In a small bowl, combine salt, garlic powder, thyme, oregano, paprika, mustard, black pepper, and cayenne pepper. Set aside 1/2 teaspoon of the spice mixture. 2 of 4 Trim fat from meat. Cut roast in half lengthwise; pat dry with paper towels. Rub the small bowl of spice mixture evenly onto all sides of pork portions. Place meat, 2 inches apart, cut sides down on a rack in a shallow roasting pan. Roast for 1 to 11/4 hours or until an instant-read meat thermometer inserted into centers registers 150 degrees F. Cover meat with foil and let stand for 15 minutes. The temperature of the meat after standing should be 160 degrees F.
3 of 4 Meanwhile, combine the reserved 1/2 teaspoon of spice mixture and the melted butter; brush over buns. Place buns on a baking sheet. Bake, uncovered, in the 325 degrees F oven for 5 to 10 minutes or until buns are heated through. 4 of 4 Carefully split buns. 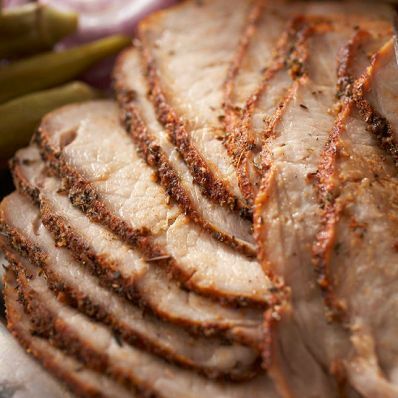 Thinly slice the pork roast. Place pork in split buns and serve with Black-Eyed Pea and Corn Relish, peach jam, and red onion. Per Serving: 3 g sat. fat, 21 g carb., 23 g pro., 51 mg chol., 10 g Fat, total, 639 mg sodium, 2 g fiber, 264 kcal cal.